Quick Book Reviews: “Civilian Warriors” by Erik Prince – Trained Thugs or National Heroes? “Civilian Warriors” by Erik Prince – Trained Thugs or National Heroes? There are very few out there who haven’t heard of the private military company called Blackwater. It was founded by former U.S. Navy Seal Erik Prince, and its main purpose was to take on high-risk and intense security jobs around the world, with its members consisting of special force veterans… none but the elite may enter. As is usual with such organizations, the contracts they undertook bound Blackwater’s members to secrecy, meaning that for many years we could only guess and approximate our knowledge about them. Throughout the years, they have been smeared in all kinds of paints and smudges, but for the first time now, Blackwater’s founder, Erik Prince, has decided to speak out on his creation. To do so, he wrote a book, Civilian Warriors, in which he discusses everything about Blackwater, from its inception all the way to its recent sale, detailing how things actually worked, who the people really were, and what happened during some of their most controversial operations. In my humble opinion, Civilian Warriors was really a much-needed book seeing as how the mystery surrounding Blackwater was starting to reach unjustifiable proportions; when one doesn’t have enough information to know whether the company’s founder is a national hero or a villain at the head of an army of highly-trained thugs, something is clearly wrong. I admit that I had, and probably still have my own prejudices against Blackwater, but nevertheless I tried to read the book with as neutral a mind as possible. From an informational standpoint, what we learn here is simply invaluable; we get the first real glimpse into the world of Blackwater and its men from the person who is in the absolute best position to discuss it. From what Prince explains, Blackwater was actually founded for the purpose of providing highly-specialized security and special operations training, for both military and law enforcement. Though at first they would take on security jobs, after 9/11 had occurred the United States found themselves in need of highly-trained security specialists for their insurgence in Iraq. From that point on, Blackwater became more involved in the military operations, and as it happens, the company was often used as a scapegoat for the mistakes of ones and the political agendas of others. All in all, Civilian Warriors is a very interesting book to read if you are interested in Blackwater, and as a cherry on top, it’s written with lots of style and will keep you interested page after page. Now, of course, one shouldn’t take anything written in this book as gospel or undisputable truth; after all, Erik Prince may still have reasons to talk favorably about Blackwater. Nevertheless, the information provided here is unique and certainly worth ingesting if this is a topic of interest for you… as a matter of fact, I think it would be a good read if you are interesting in modern warfare and private military companies in general. 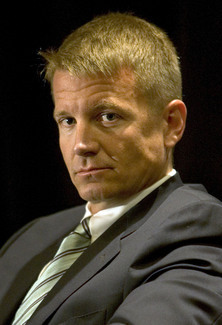 Erik Prince is a current businessman and former U.S. Navy Seal, who also founded the internationally-renowned Blackwater group, a private military organization consisting of special forces veterans. Recently, he wrote a book titled Civilian Warriors, wherein for the first time he exposes the truth behind the organization he himself founded.